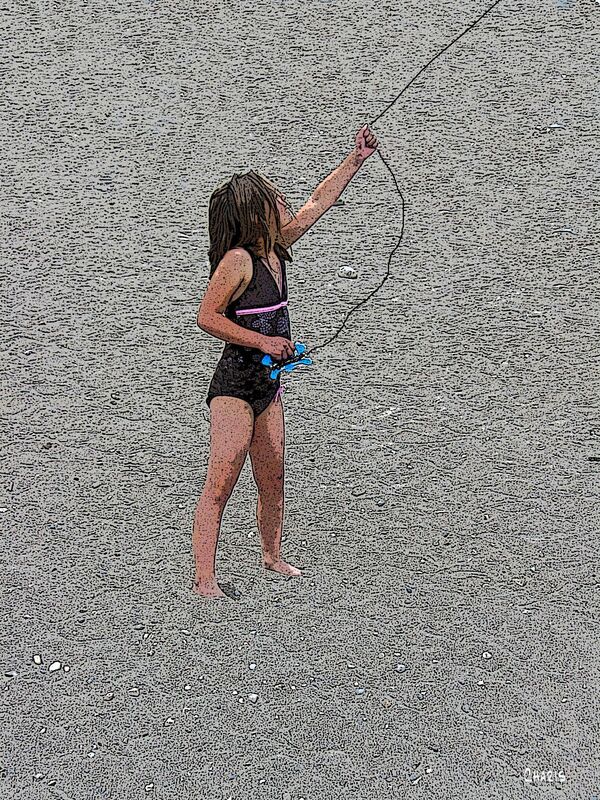 I was about eight-years-old when the boys down the lane said they were going to beat me up for breaking their kite. It was a flimsy kite, one of those corner-store balsa wood and tissue paper assemblies with a picture of some serious stars and stripes American guy in a tall hat, who pointed his finger accusingly at a girl who didn’t know enough to stop running when the thing dive-bombed into the ground. I had begged them for a chance to fly it and when they told me to grab the string and run, run, run, I did. Then it crashed and I apparently dragged it through the construction debris scattered in the empty lot. I saw one of the boys punch his friend in the arm for being so stupid as to let a girl try to fly the kite. It was a boy’s toy after all. Then they threatened to punch me unless I paid for it. Both of them. I slipped by all the grown-ups in the living room on the way to find the piggy bank hidden under my bed. I was crying, but I knew enough not to bother anyone with my problem. Their tone was serious and I was afraid if they found out I had broken something else there would just be more trouble. I was used to not being noticed –because I knew how not to be noticed. It was my fault, after all. I did break the kite. I would have to look after the problem myself. My uncle was standing in the hall when I came out clutching my precious coins. He noticed. I was afraid, but I choked out the story of how the boys told me to hold the string and run and not look back, but then the kite broke and now they were going to beat me up. My uncle was barely more than a teenager, but he was a hockey player, a defenceman. In this part of the world that carries a lot of weight. For one thing, he was nearly a foot taller than everyone else in the family. For another, he was known to spend an inordinate amount of time in the penalty box, which seemed quite all right with everyone who went to cheer at the games. I walked bravely down the lane with my uncle backing me up. I had never really noticed how magnificently tall he was before. The boys were confused when they saw him. I don’t know whether they wondered if they should run or ask for an autograph. I kind of hoped Uncle would throw some of that influential weight around and knock them over. “A buck,” one of them said, looking up, way up. Uncle took out the wallet that hung from a chain attached to his back pocket and handed him a dollar bill. “And how much did that one cost?” he asked the boy who held an intact version of the one still in the middle of the crash site. “Seventy-five cents,” he answered, suddenly struck with an uncharacteristic streak of honesty. “If you ever threaten a girl again you’ll answer to me,” he growled. When they took off running he grinned. I walked home with my money in one hand, my kite in the other and a new admiration for my uncle in my heart. Have you ever had a week when the same topic, or the same book or the same quotes keep showing up in unusual places? I keep running into Psalm 18, about how God defends his loved ones. I know that means I need to pay attention, that there is something about Himself I haven’t truly understood before that the Lord wants to show me. I was meditating on this Psalm when the memory of this incident with the kite came back. Our Defender not only walks with us, he covers our debt, he gives us what we never earned and he brings us safely home. God is good that way. He is my hero. Love the story! Your uncle definitely was an image of God our defender. He had a kind heart. It’s interesting how the Lord provides people in our lives who can show us aspects of himself. It amazes me who he uses sometimes. Many of them would never be found in a church, yet we can catch glimpses of the image of God in those who still carry nobility. Yes, this is so true. All have some aspect of the Lord in their DNA. I think he likes to surprise us in who he uses!